This is the second of three reviews for Winestyr. For an introduction and how this wine club service works then check out Part 1's review of Anaba Sonoma Valley 2012 Turbine White. 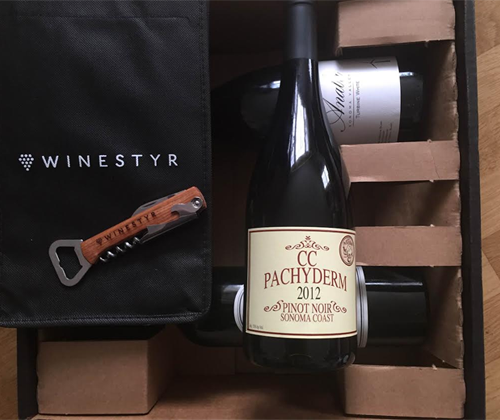 Here in Part 2 I'll be going over the actual package and reviewing Claypool Cellars Pachyderm Sonoma Coast 2012 Pinot Noir, then in Part 3 I review Colcanyon Estate Wines 2009 Cabernet Sauvignon and give my overall impression of their wine club. - A cloth wine bag with their logo that holds two standard bottles of wine. Nice quality material and, most importantly, strong stitching. 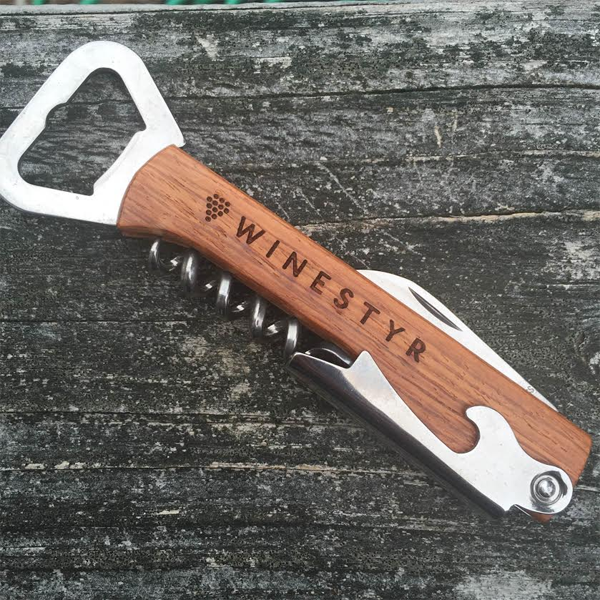 - A wood handled corkscrew / cap opener. I expected it to be kinda loose and crappily made but it works and it's totally solid. However, for me it's just a cool thing to have and it will be a nice decoration in my office at work. I prefer the smooth sailing of the efficiently done waiters corkscrew. - A personally written note to me by founder Bob Wilson hoping that I enjoy the experience. Also, a printed card on the same impressive stationary (it doesn't take much to impress me there) with their mission statement. 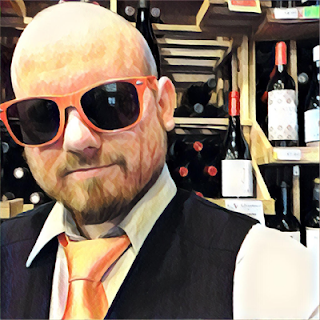 - Leaflets, for the lack of a better term, done in a very hipster way that gives you the information for each wine in your shipment. It's most definitely from recycled paper but I've never seen the kind of clip they use to hold it together in my life. 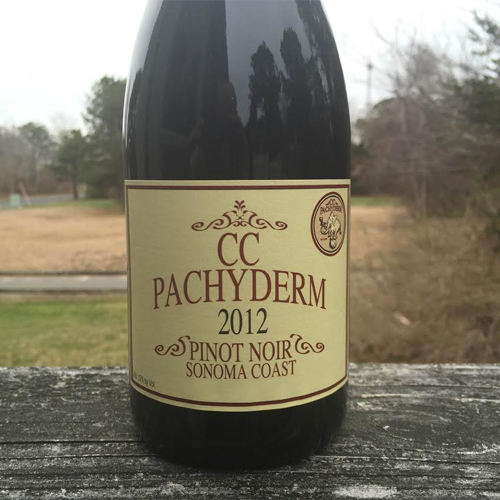 Claypool Cellars Pachyderm Pinot Noir!!! I gave a little fist pump when I saw that it was included in my pack. The wine was founded by Les Claypool and I trust that you already know who he is. But if not, just in case you've been sheltered from rock n' roll for the past twenty years (shame on you), he's the frontman for the band Primus and among the greatest bassists in history. Both winemakers are also from Flowers, one of the most iconic wineries in California: Katy Wilson and Ross Cobb. Just the label itself is legendary. I love it. It just has a feeling of being old-school. Like it's the 1800's and it's being prescribed to me by my doctor to cure the flu. Meanwhile it's actually full of heroin and I'm about to develop a serious addiction. Plus... it's called pachyderm. Does that not give you flashbacks to Dumbo in the circus? Dumbo was a really depressing movie. I still have issues from watching it as a kid. What's NOT depressing? 100% Pinot Noir, 14.1% ABV, and 480 cases made, that's what. It's a darker colored Pinot but the depth is still thin, so I'm expecting the kind of profile you want for $53. The nose is toasty, earthy, mossy and coppery with plum as the fruit aroma. As it opens up some chocolate and black cherries appear. What a nose! This is my kind of Pinot Noir! It's light bodied and the acidity is very high but it's charming and belongs to the bigger picture, rather than unchecked and distracting as Pinot acidity can sometimes get for me. There's flavors of tart cherries, plum, sandalwood and copper. The finish is silky smooth and leaves you annoyingly smacking your cheeks and licking your teeth long after you swallow. This is a really nice bottle of Pinot Noir and worth the $53. I recommend it for those that have the cash! But... dude... it came in a package of three wines that's worth $120 but only cost $75. Let's do the math: $75 - $53 = $22. The cheapest bottle in the set is $28. So with two bottles instead of three you're already saving money. I'm on my second bottle of three and I'm already sold on this wine club. CHECK OUT WINESTYR.COM!